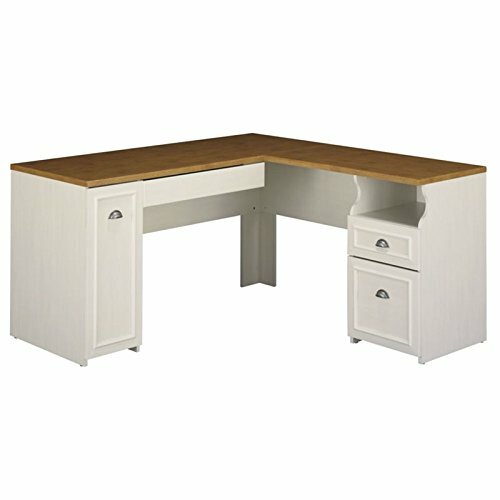 Bring a slice of cottage comfort into your home office with the Bush Furniture Fairview L Shaped Desk. Enjoy your morning coffee, surf the net and pay bills with plenty of room to spare on the L Shaped Desk's durable surface. Stash pens, paper and checkbooks in the box drawer and open storage space, while organizing mail in the file drawer to clear the work surface. Store your laptop or keyboard in a drawer with a drop-down front, and take advantage of a large vertical closed storage area with an adjustable shelf. Charming accents and Antique Pewter hardware add character to your home office. 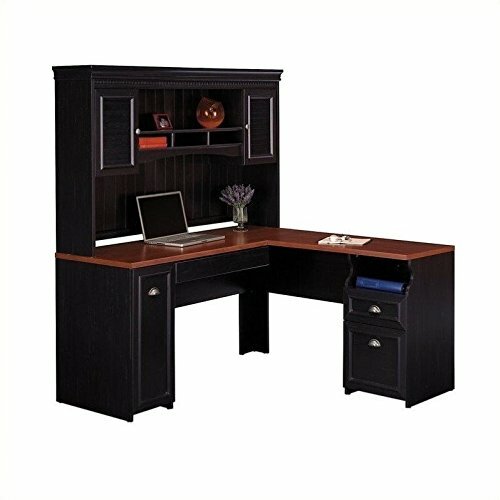 Attach the Hutch (sold separately) to either side of the L Shaped Desk to fit your needs. Available in attractive Antique Black with Hansen Cherry Accents or Antique White with Tea Maple Accents, Fairview meets ANSI/SOHO quality test standards for performance and safety, and comes with a Bush Furniture 6 Year Manufacturer's Warranty. See the full collection for coordinating items available, including the Hutch. 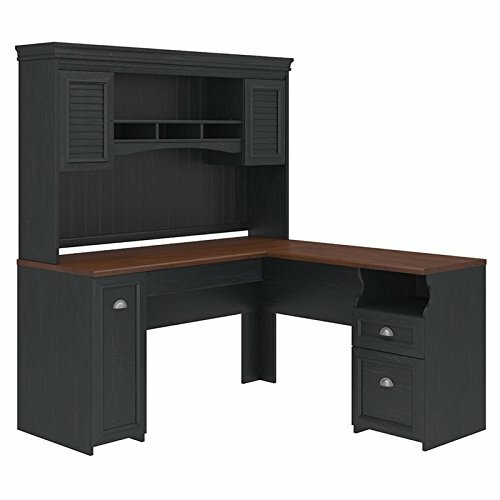 Bring a slice of cottage comfort into your home office with the Bush Furniture Fairview L Shaped Desk with Hutch. Enjoy your morning coffee, surf the net and pay bills with plenty of room to spare on the L Shaped Desk's durable surface. Stash pens, paper and checkbooks in the box drawer and open storage space, while organizing mail in the file drawer to clear the work surface. Store your laptop or keyboard in a drawer with a drop-down front, and take advantage of a large vertical closed storage area with an adjustable shelf. Charming accents, Antique Pewter hardware, framed louvered doors and attractive moldings add character to your home office. Along with two closed storage areas, the Hutch features an expansive center shelf with enough space for binders or mementos. Keep current projects nearby with three work-in-process cubby shelves, and attach the Hutch to either side of the L Shaped Desk to fit your needs. Available in attractive Antique Black with Hansen Cherry Accents or Antique White with Tea Maple Accents, Fairview meets ANSI/SOHO quality test standards for performance and safety and comes with a Bush Furniture 6 Year Manufacturer's Warranty. See the full collection for coordinating items available. 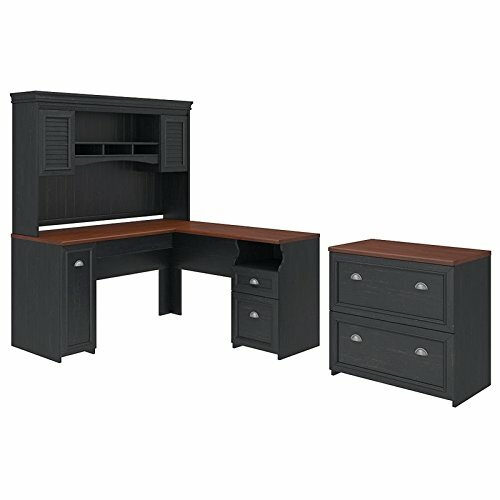 Bring a slice of cottage comfort into your home office with the Bush Furniture Fairview L Shaped Desk and 5 Shelf Bookcase. Enjoy your morning coffee, surf the net and pay bills with plenty of room to spare on the L Shaped Desk’s durable surface. Stash pens, paper and checkbooks in the box drawer and open storage space, while organizing mail in the file drawer to clear the work surface. Store your laptop or keyboard in a drawer with a drop-down front, and take advantage of a large vertical closed storage area with an adjustable shelf. Charming accents and Antique Pewter hardware add character to your home office. The Bookcase features three adjustable shelves so you can display books and knickknacks of varying sizes, and two fixed shelves for stability. Available in attractive Antique Black with Hansen Cherry Accents or Antique White with Tea Maple Accents, Fairview meets ANSI/SOHO quality test standards for performance and safety and comes with a Bush Furniture 6 Year Manufacturer’s Warranty. 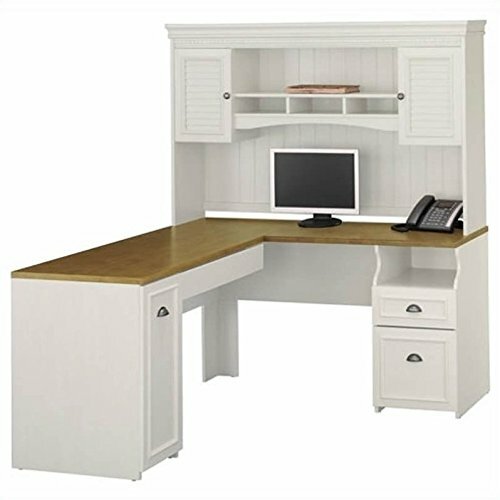 Bring a slice of cottage comfort into the home office and tidy up your workspace with the Bush Furniture Fairview Hutch for L Shaped Desk. Along with two closed storage areas, the Hutch features an expansive center shelf with enough space for binders or your favorite mementos. 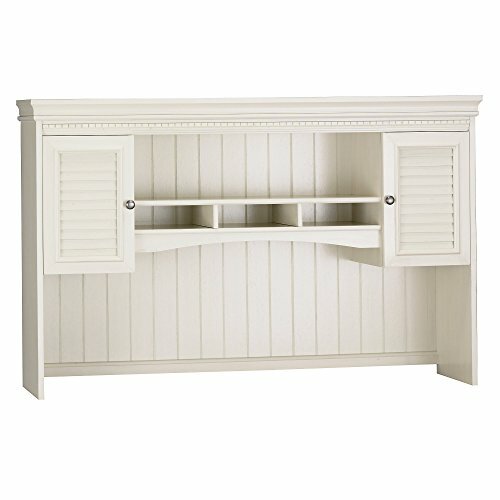 Store current projects nearby with three work-in-process cubby shelves, and attach the Hutch to either side of the L Shaped Desk (sold separately) to fit your needs. 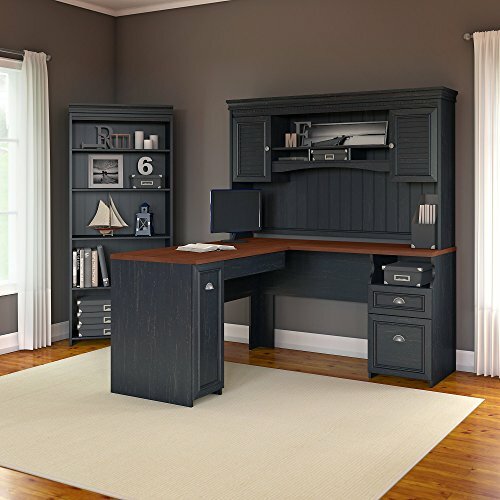 Antique Pewter hardware, framed louvered doors and attractive moldings add character to your home office, while the durable design fends off scratches for a long-lasting professional appearance. 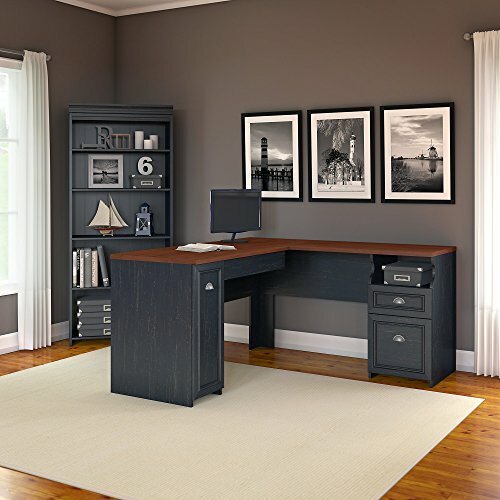 Available Antique Black and Antique White finishes blend seamlessly with existing decor for a charming look that works anywhere, and a wire management system hides cords and cables for a clutter-free workspace. Fairview meets ANSI/SOHO quality test standards for performance and safety, and comes with a 6 Year Manufacturer's Warranty. See the full collection for coordinating items available, including the L Shaped Desk. Bring a slice of cottage comfort into your home office with the Bush Furniture Fairview L Shaped Desk with Bookcase and Lateral File Cabinet. Enjoy your morning coffee, surf the net and pay bills with plenty of room to spare on the L Shaped Desk’s durable surface. Stash pens, paper and checkbooks in the box drawer and open storage space, while organizing mail in the file drawer to clear the work surface. Store your laptop or keyboard in a drawer with a drop-down front, and take advantage of a large vertical closed storage area with an adjustable shelf. Charming accents and Antique Pewter hardware add character to your home office. Lateral File Cabinet matches desk height to extend the work surface, and full extension file drawers glide on smooth ball bearing slides for easy access to letter, legal and A4 size files. Bookcase features three adjustable shelves to fit all of your favorite items and two fixed shelves for stability. Available in Antique Black with Hansen Cherry Accents or Antique White with Tea Maple Accents, Fairview meets ANSI/SOHO quality test standards and comes with a 6 Year Warranty. See the full collection for coordinating items. 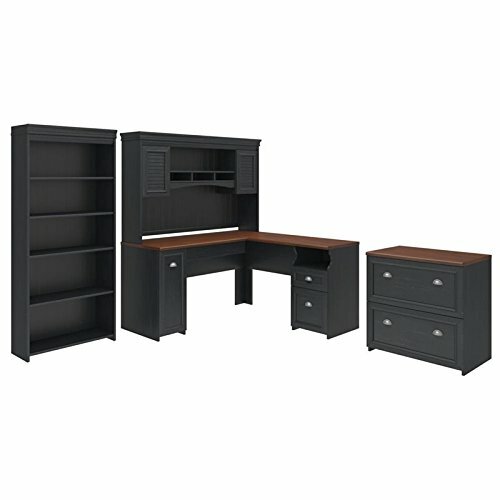 Compare prices on Fairview L-desk at ShopPlanetUp.com – use promo codes and coupons for best offers and deals. We work hard to get you amazing deals and collect all available offers online and represent it in one place for the customers. Now our visitors can leverage benefits of big brands and heavy discounts available for that day and for famous brands.